We all like to have a nice, clean bathroom but maybe you’re like me and hate cleaning the bathroom- especially the toilet. The toilet bowl is a bathroom fixture that is most prone to germs and unpleasant odors so it definitely needs to be cleaned, but anything that lets me go longer in between scrubbing the toilet bowl is worth looking into. One small and cleaning product that I’ve found helpful is a simple toilet tablet that can make the process a lot easier and more hands-off. I like the Scrubbing Bubbles Toilet Cleaner Drop-Ins, so featured it as our top pick but we’ve also included a few other picks below. Automatic Toilet bowl cleaners, also called toilet drop-ins, toilet rim cleaning blocks, tablets or discs have become quite popular in recent years. This is not surprising since they automate cleaning your toilet and avoiding the hassle of having to manually scrub the inside by hand. Here we highlight some of the best toilet bowl tablets. But first, let’s consider some essential points while looking for an automatic toilet cleaner. While these won’t prevent you from needed to give your toilet bowl a proper cleaning, they can keep your toilet clean and give you a little more time between deep cleanings. Drop-In vs. Clip-On: Some automatic toilet cleaners are simple “drop-ins”, you just drop them into the water inside the tank while others clip onto the inside lip of the tank. Bleach Content: We’ve reviewed some contain chlorine bleach and others that are bleach-free. If you have persons in the house that have a sensitivity to chlorine. Eco-Friendly: Whether you have a sensitivity to chemicals or live on a property with a septic system, we’ve included some more natural options. Color: Some of the drop-ins come with a blue dye that some people like-finding it a pleasant color and also some like to know that it’s working (or hasn’t totally dissolved) since they can see the blue tint with every flush. Others may prefer the more natural look of transparent since it just looks like a normal flush with water (without and unnatural looking color). With so many brands of toilet bowl cleaners available in the market may leave you quite confused, here, we attempt to make your job a bit easier by highlighting three of the best toilet bowl tablets trending in the market today. This automatic toilet cleaner by SC Johnson will keep your toilet bowl clean on a regular basis since the cleaning is a continuous process. Each flush not only cleans but also deodorizes the toilet bowl, minimizing the effort and frequency that you’ll need to manually clean. Another useful feature of these discs is that they are not harmful to children or pets, a reassuring fact for those of you who have a dog with a penchant for toilet bowl water, but it is still avoidable! These toilet drop-ins are also safe for the various parts of your flush tank. When these products first came on the market, some plumbing professionals warned consumers not to buy drop-ins. The main reason was that some of the early products were corrosive, over time eating away at the rubber parts used inside the toilet tank – like the toilet flapper. In the long run, these would wear out the seal and the toilet would stop flushing correctly. Luckily, many newer products on the market, like these Drop-Ins by SC Johnson have resolved the problem by using ingredients that are safe for the toilet tank and the parts used inside. For those of you who get a supply of hard water, there is good news in that aspect as well, as Scrubbing Bubbles Toilet Cleaner Drop-Ins work well for descaling the lime deposits from your toilet bowl. These discs are also easy to use – just drop one into the back of your toilet flush tank, and it starts to work – you don’t have the hassle of installing complicated equipment. You just replace the toilet drop-ins once the blue coloration of the water begins to fade. 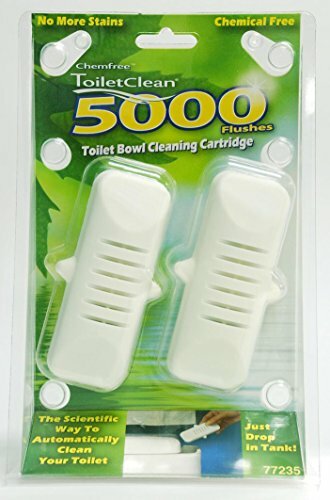 This toilet cleaning system is a cartridge-based one, so, you need to install the cartridge and disc once and then you just refill the cartridge with the toilet tablets whenever required. Clipping the system to the back of the toilet tank may need a bit of innovation, as the structure of toilet tanks may differ, but the procedure is relatively simple if you just follow the instructions on the packaging. You do not need to use any tools for the installation of the cartridge. The Kaboom Toilet Clean System is an automatic toilet cleaner system which helps to reduce the need to scrub your toilet bowl and imparts a pleasant, clean odor. This toilet bowl cleaner also helps to remove mold accumulation. This toilet cleaning system lasts longer than others reducing the hassle of having to reload the cartridge with discs that often. The general feedback from customers is that this automatic toilet cleaner system is quite useful in removing unpleasant odors and keeps the toilet bowl clean. In theory, it should be super easy to snap in. However, initial installation can be a bit of an issue for a small percentage of people that have unusually shaped tanks. Another advantage is that there are generic refill tablets that fit the Kaboom system which works out quite a bit cheaper if you are looking for an affordable option. Here is a brand of toilet drop-ins that claims to kill 99% of germs on a regular basis. The discs last for three months. They contain a high percentage of bleach so, while somewhat effective in killing bacteria and removing bad odors, the smell of chlorine can be slightly overbearing to sensitive souls! The Clorox Automatic Toilet Cleaner is useful for getting rid of stains caused by lime and mineral build-up which are caused by hard water. The Clorox discs are easy to use – just lift the lid of the flush tank and after flushing to empty the water from the tank, place the tablet towards the back of the tank. The cleaning action starts almost immediately and lasts for about two months, although the deodorizing effect continues up to three although, in theory, one tablet can be good for up to 10 flushes per day for 3 months (max 900 flushes). Most customers who used this automatic toilet cleaner claimed that they were quite satisfied with its effectiveness regarding cleaning power and deodorizing action. The ChemFree Toilet Cleaner is cleaning aid that aims to rid you of the need to scrub manually. It works good enough for 5000 flushes. It is completely safe and sanitary. All you need to do is drop the Chem-Free cartridge into your tank. The way it works is it prevents mineral particles from creating stains and forming hard-to-remove rings around the toilet bowl. It prevents mildew and fungus growth while stopping further bacterial growth. It is perfectly safe for homes with kids, babies, and pets. It is also eco-friendly and won’t damage your septic system. The cleaner is six inches long. 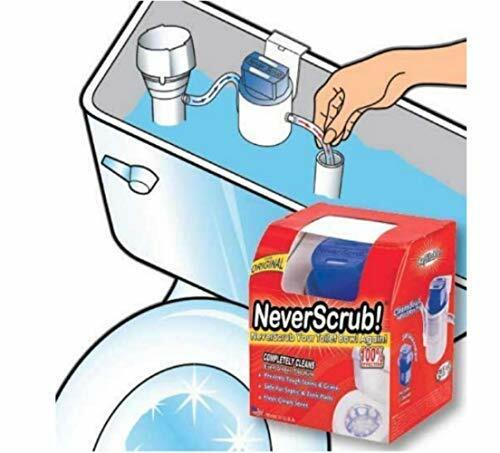 The NeverScrub Toilet Cleaning System promises an effortless and automatic way of cleaning and maintaining your toilet. It fights off stains by releasing a concentrated solution into the water whenever you flush the toilet. It is a good solution for toilets that keep getting stained because of the high mineral content found in hard water. It also cleans mildew and rust stains, among others. The cleaning system can work for up to three months at a time. Imagine not having to scrub the toilet for that long a time, and still getting a clean and hygienic seat. In addition to cleaning the toilet, it also prevents all future stains and grime from ever forming. This toilet cleaning solution is also septic-safe. Installing it is a breeze also, you don’t need to have special tools or hire a professional to install the system. Follow the simple instructions in the packaging. You will have it up and running in three easy steps. 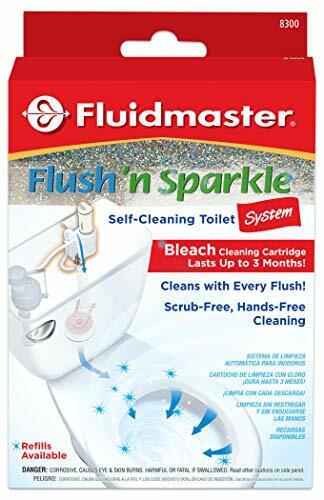 The Fluidmaster 8300 Flush ‘n Sparkle Automatic Toilet Bowl Cleaning System’s name says it all. It’s a self-cleaning toilet system that treats your toilet. This one does have bleach so we wouldn’t recommend it if you have a septic system. Instead, we’d recommend the NeverScrub that we reviewed above. The system is very easy to install. All you need to do is follow the simple instructions found on the packaging. There are no special tools required. You can do it on your own and have it up in just a minute. The idea is to keep your toilets clean without ever having to hold an actual scrub or brush, without damaging any parts of your septic system. You can use the same system for a very long time. You will just need to replace the cartridges every three months. The cartridges are completely eco-friendly, and you get two cartridges in this purchase. They perform their cleaning power using bio-action, which not only keeps the tank and toilet hygienic and sanitary – they also reduce any future clogging and bacteria growth. Since we are talking about keeping our bathrooms and toilets clean in a more efficient and automatic way, why not spend some time taking a look at the septic tank, too? Here’s a bonus product that will keep your septic tank safe, sanitary, and odorless. 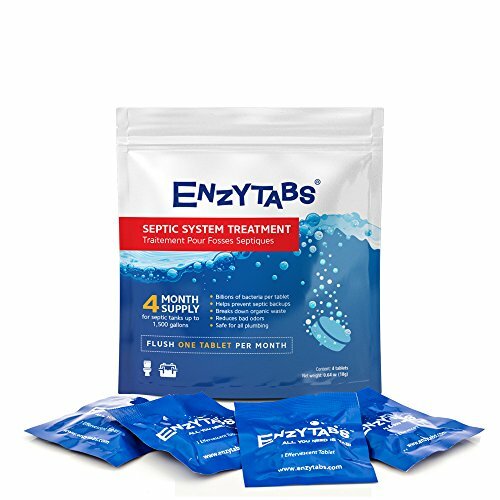 The Enzytabs Septic Tank System Treatment prevents a backup in the septic system by breaking down starch, grease, tissue, and protein. The effects are long-term and ongoing, and you don’t have to do it often. As an effect, the bad odors coming from the septic tank are reduced. The tabs continuously break down the fatty acids that are volatile and produce organic buildup and bad odors. The tabs are pre-measured and in effervescent form. You don’t need to mix, measure, or prepare anything. They’re ready to go. Because they aren’t in liquid form, no spills and no mess will have to ensue. All you have to do is flush the tabs down the toilet. The tabs are formulated using plant-based ingredients. This means they are perfectly biodegradable. So when it goes down the system, it won’t add up to the pileup – it will break down on its own while doing its job. As it is released into the water, it launches billions of enzymes – the secret to its efficacy. These enzymes break down clogs and growths that it meets on its way, and you end up with a cleaner, safer system down below. It is also 100% phosphate free Each tablet continuously works for 1500 gallons of flushed water. That means you only need to use one tablet a month. The package has four tabs, which gives you a four-month treatment supply. If you are more of a DIY person, you can check out our DIY Septic Tank Treatment recipe here to make one on your own. 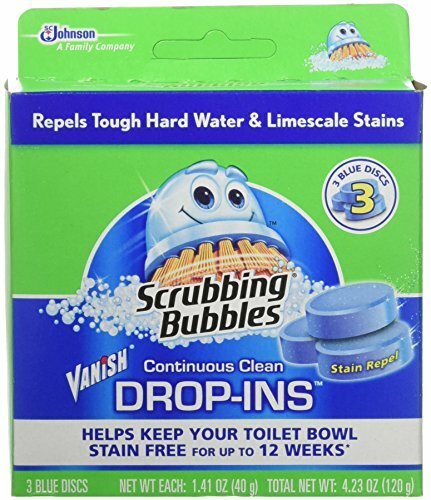 So, we concluded that the Scrubbing Bubbles Toilet Cleaner Drop-Ins is the clear winner out of all the other brands. This toilet bowl cleaner is easy to use, efficient and does not give off an unpleasant odor. Most importantly, this name has received excellent reviews from customers who used the product, which is a clear indication that it is a product worth using. 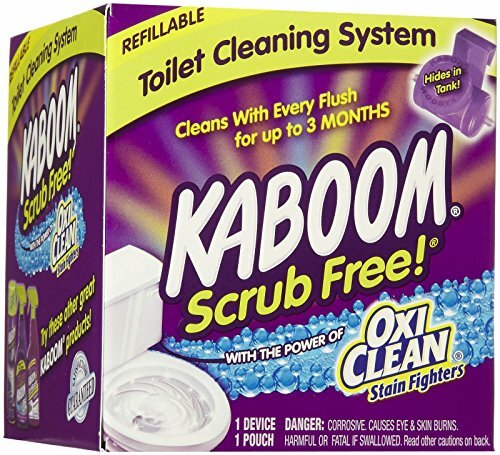 However, if you prefer a cleaning block that clips in the tank, the Kaboom System is a good choice. 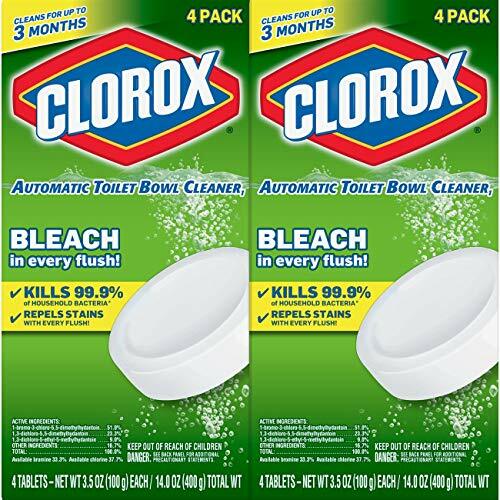 Finally, if you prefer a stronger product with bleach, the Clorox option delivers heavy-duty cleaning power and the company claims to kill 99 of germs with their drop in solution. We hope you have enjoyed reading this article. Please feel free to send us your valuable feedback, comments, and questions, if any, and we will be glad to respond.